BranchPattern was a pioneer in introducing LEED to the warehouse industry. Without an official LEED rating system tailored for warehouse and distribution centers, BranchPattern helped create what is today LEEDv4 for Warehouses. As partners with Real Estate Investment Trusts (REIT), BranchPattern work has identified ways to incorporate sustainable design in manner that creates economic value and supports portfolio efficiency. Working with Prologis, a Global REIT, we sought to meet the intent of the LEED rating system while adapting the program to better meet the unique aspects of their buildings and more efficiently integrate with their project delivery process. This effort resulted in the first LEED Volume Program for Core & Shell development. By crafting a customized LEED Volume program, Prologis is able obtain certification for projects with greater speed, consistency, and quality. 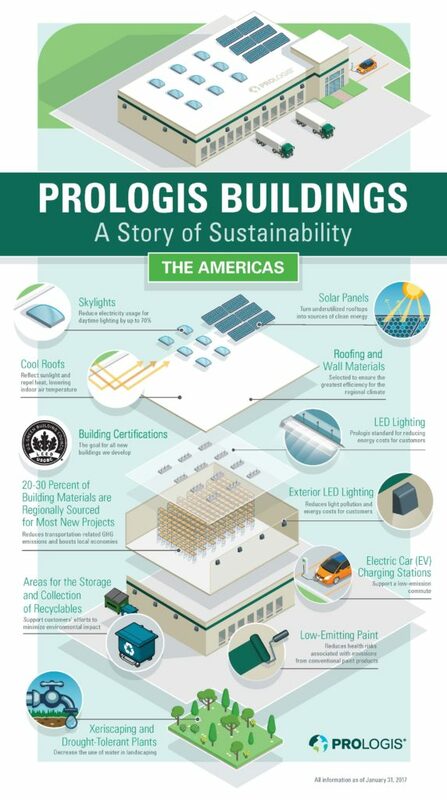 Prologis’ LEED Volume program has resulted in LEED certification for an average of 20 projects per year, in North America, South America, and most recently Europe. This approach to certifying the sustainability of their real estate portfolio is a key aspect of ProLogis’ environmental, social, & governance (ESG) leadership, evidenced by their consistently high scores within the Global Real Estate Sustainability Benchmark (GRESB) program.